Another giveaway for you, and this is one of my favorites. The skin you are born with is the same skin you will have your entire life, so it's important to take care of it. Pangea Organics is the fastest growing organic skin care line in the world. They use only the very best, filling each bottle with ingredients that are needed, and none that aren't. No phosphates or chemicals, simply pure and organic. Each product is designed to create and maintain balance in your skin. The ingredients are hand-picked and specially blended to perform many functions. Plainly put... they multi-task. These ingredients cleanse, exfoliate, detoxify, balance oil production, condition, tone, nourish, hydrate, protect, soften, heal, regenerate skin cells and collagen, stimulate, revitalize and are highly antioxidant. And, if that isn't good enough they are anti-aging, anti-inflammatory, anti-irritant, soothing, gentle, calming and restorative. 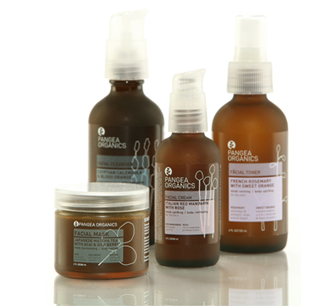 Today Pangea Organics is giving away a set including their Facial Toner and Facial Cream. The perfect at home treatment for your skin, they will leave you feeling fresh, rejuvenated and your skin will have that healthy glow we're all in search of. Which Pangea Organics product would you most like to try? *winner will be announced Monday January 19th along with winners from each giveaway in the giveaway-a-day sequence. note: each giveaway must be entered separately. Good Luck and Thank You Pangea Organics! I'd love to try the scrub! Sounds like a great product. I would love to try the facial toner and the scrub. I would love to try a cream; something with thym. The Chamomille Cream sounds great, would love to try it. I am with everyone else, the scrub!!! A much needed product in the winter. The scrub or the facial mask! This stuff would be wonderful with being pregnant...I hate using everything with chemicals in it! ohhh. camomile orange blossom please! i would love to try the chamomile lotion, my son has a very dry skin and i always looking for naturals body lotions. I would love to try the scrub with cranberry. YUM! I love a good cleanser .... but actually that scrub sounds pretty lovely! the combination are incredible. i grow herbs so it delights me to see all these fragrant herbs & flowers & soothants combined into skincare products. i'd like to try the chamomile & orange blossom cream. I love that they are giving away products for oily skin. Everyone seems to focus on dry skin and hair, but some of us still have natural oils to deal with! i would love to try the italian red mandarin with oranges face cream. Mmm, what a great giveaway! The tangerine lime toner sounds divine! Thanks for the chance to win! I'd love to try the italian red mandarin cream. my skin is thirsty just thinking about it! I want the whole line of Egyptian Geranium with Adzuki Bean and Cranberry!! Yum! The scrubs look fantastic. I would like to start there. Everything sounds divine! I'd love to try the scrub most of all. The French Chamomile with Sweet Orange and Lavender lotion sounds so wonderful and relaxing. I'd love to try it! I would love to win and treat myself to a scrub! Chamomile and Orange sounds so refreshing! Brynn: I would love to try the cleansers and see how they work on my sensitive skin. The scrub sounds great. Ginger, lavendar and thyme facial moisturizer sounds heavenly. I am always looking for a good scrub and/or mask. The Matcha Tea facial mask looks fabulous - I would love to try it. Ooooh I love Pangea! I would get the egyptian basil and mint body wash, love the scent! I want to try the cleanser. I've used Proactiv for years and my face is ready for a change. Hands down any of the lip cares! Perfect for this dry weather in Utah! I would love to try any of the creams - I live in Vegas. I would like tot ry their Lavender/Cardamom oil. That sounds great. All their stuff sounds great! I love it and want it! I would love to try their whole cleanser line!!!! I have trouble with acne and can't seem to find anything that works! I would love to try the Italian Red Mandarin with roses facial cream. Sounds absolutely wonderful! The "Peace" Holiday gift set looks like a nice collection of items-thanks! I'd have to go with the scrub, having never really used one, what a chance to try something so quality! I would love the green mandarin and Lime toner and the coconut olive oil soap. Yum! amazing! i'd love to try their lipcare and toners. that french chamomile & orange blossom sounds so delicious. Oh give me some moisture! I would soak up the nigerian ginger/sweet lavender & thyme cream. Yum! The Lemongrass/Rosemary shower gel - mmmm. The Peace holiday gift set looks neat (even if it is after the holidays). That French Chamomile and Orange Blossom set looks great! I'm thinking their lipcare looks pretty awesome too! The chaomomille cream sounds great, I would love to try it! I would love to have any of it! It all looks fabulous! I'd have to go for the cranberry scrub! Tangerine + Thyme? My skin is crying out for this. I think I would try the lavender and cardamom massage oil. Sounds very relaxing! Indian lemongrass with rosemary sounds so refreshing! Would love to try the Egyption geranium scrub. Wowsa! i love all the new organic product lines out now. would ove to try this! i would love to try their sensitive skin products and thie hand soaps. this all must smell so divine! Egyptian mint & basil lotion! I'd love to try the Indian Lemongrass with rosemary bar soap. The French Rosemary with Sweet Orange toner. The Japanese Matcha Tea Mask sounds fun and also the scrubs. Yummy. A scrub that can be used DAILY or weekly? That's what I would love to try. Plus the ingredients sound lovely. All the scrubs look wonderful! I would love to try the Italian white sage with geranium and yarrow liquid soap. Oooh Indian lemongrass and rosemary! Sounds delicious! And in a shower soap -- fabulous. I would love to try the cleanser. I have been looking for an alternative to Clinique. Ooh, I have thirsty skin so I'd like to try the Italian Red Mandarin w/ Roses. Thanks! I would love to try their Japanese Matcha Tea with Acai and Goji Berry mask! My face could use a little pick me up and this sounds perfect! I love the Harmony Gift Set, plus I would love to plant the packaging so I could grow a spruce tree in my back yard, what a cool company! Oh man, I would LOVE to try it all, I am constantly trying to find a skin product that isnt irritating, I am psoriasis, and I just want something to help me with it that isnt greasy or gross smelling! I would love to try the Japanese Matcha Tea with Acai and Goji Berry. I don't know, but something about masks feels so luxurious! Oh, who couldn't use a little refreshing! I'd love to try the Japanese Matcha Tea mask. I'd love to try the Lemongrass lotion. I've been wanting to try their toner! I like that they give you full ingredient lists on the website. I would love to try the Egyptian Geranium with Adzuki Bean and Cranberry body scrub. I would love the scrub and toner and maybe the japanese tea mask! I'd love to try the bean and cranberry scrub as it would be perfect for this dry winter skin of mine! my lips are dead so I would love to try the Italian mandarin with rose lip balm! the face wash and toner sound like the perfect things to try first! I would love to try the Chamomille Cream. I'd love to try the Japanese Matcha Tea Mask!! I would love to try the cream! It looks fabulous. I would love to try the scrub or cream. The Italian Green Mandarin with Sweet Lime toner sounds yummy! I would love to try the scrubs as well since I always feel extra clean after using a good one! I would love to try the mask. My skin needs some major rejuvenation! the orange blossom toner. yum. I am a sucker for anything that smells good - anything thyme sounds great to me. The Japanese Tea Matcha mask or anything with the smell of orange blossom. I'd love to try the Pyrenees Lavender and Cardamom Liquid Soap. They have so many great items. I'm looking for a new facial cleanser, it sounds yummy. The Egyptian Calendula and Blood Orange cleanser sounds great! I would love to try the scrub! Everything there sounds so soothing! I think I need a spa day! I would love the cranberry scrub! Although it all sounds yummy! good stuff. Facial toner and scrub! I'd love to try the scrub! italian white sage and geranium oil. any of the oils sound lovely. i have tried some of there other products and like them a lot! but the oils would be new to me. most like to try italian madarin with roses cream - products look fantastic! The Japanese Matcha Tea w/Acai &Goji Berry Facial Mask looks awesome. It must be b/c they are currently our of stock. Thanks!! i'll take any of it....the scrub looks nice! I love that they have the full ingredient list on the site! So nice! I think the Fennel with Rosemary and Mint Moisturizer. Sounds perfect! I'd like to try the facial scrub. They all sound great. I always like a good scrub. I'd like to try the Japanese Matcha Tea ith Acai & Goji Berry mask! I don't normally do masks but this one looks really good!! The lip balms look great! I want the scrub! I think it sounds yummy! I would love to try one of their creams. I would love to try the French Cammomile & Orange Blossom. My skin is very sensitive and prone redness, so I'm hoping this would soothe it. The Chammomile with orange and lavender sounds divine! I would love to try the Egyptian Geranium facial scrub! I usually use St. Ives, and it'd be nice to try a different brand, completely organic and good for my skin! I would love to try the cranberry scrub. I love cranberry smell and I could really use this. Thanks for the giveaway! the Egyptian grapefruit and sweet orange lip balm, i just lost my favorite grapefruit chapstick and i need a replacement! I'd love to try the cleanser and lip balm. They all look lovely. The Chamomille Creamounds lovely! These products look wonderful-I would love to give them a try! I need any and all of it! Please pick me! I'd love to try the geranium/cranberry scrub! my face is begging me for the cranberry scrub...maybe it can settle for some facewash! I would love to try the Pyrenees Lavender and Caradamom lip care. I turn 30 this year and have been hunting for a good skincare line. I'd love to try their cleanser and mask. Ah, I love a good mask. these sound so heavenly - I'm a sucker for all things lavender - the facial cream with lavender sounds like a dream! My skin has been having a hard time since I moved from a humid climate to a dry one a month ago. I'd love to win! The number one thing on my list would be the ginger, lavender and thyme cream. Yum! 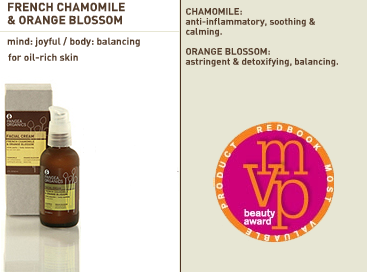 Egyptian Calendula and Blood Orange cleanser and Japanese Matcha tea mask sound phenomenal! The cleanser looks so awesome! Thanks for introducing me to these wonderful organic skin products! 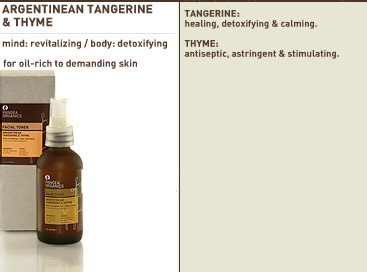 my face needs help....so i would LOVE the tangerine and thyme products! The grapefruit lipcare looks lucious. I can never find a toner I like! I'd try that. Italian Rose Mandarin Lip Balm. Kissable lips! I would love to try the Japanese Matcha Tea with Acia and Goji Berry mask! I would love the facial toner and scrub. I've been looking for an organic product for a while now. I would love to try it out! I'll start with the scrub and toner. I'm a sucker for new skin products! The facial mask sounds great. I'd love to try it! I'd love to try to cleanser. I've been looking for a good one! I would love to try the cleanser and scrub. anything "scrub" sounds fabulous to me! Oh, I've always wanted to try their facial scrubs! i would love to try the facial toner and/or the cranberry scrub. facial toner! looks like a must have! the scrub looks pretty amazing! It has to be the cleanser for me. I'm just not seeing results with my old skincare system anymore, and the organic really appeals to me.